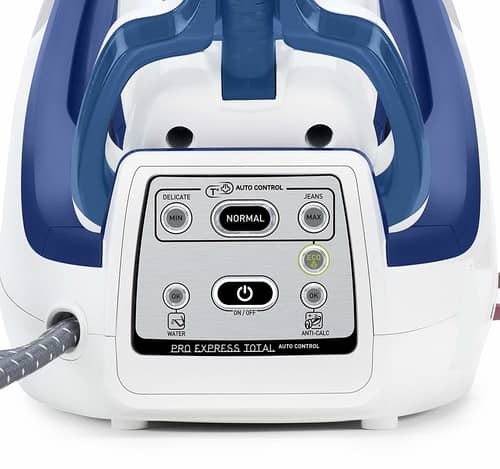 Thanks for taking the time to read our UK review of the Tefal GV8931 Pro Express Total Auto High Pressure Steam Generator. That is a long name for sure, and many of this type of iron, have these very long names. This particular model has an RRP of £249.99, but you can almost always find this much cheaper online, so well worth having a look around, if you are considering buying this particular model. This model is at the higher end of the price point for these types of models. In terms of specification it is a high standard with 6.5 bars of pressure and a 1.6 litre water tank. About 2/3 of all UK buyers rate this model as a 5 star product, and when compared to other steam generator irons, the number of complaints on this model are pretty low at around 6%. Who Would Buy the Tefal GV8931? How Buyers Rate the GV8931 Model? This model of iron is suitable for buyers who want to really reduce the amount of ironing time. Most buyers of this product did say that it cuts their ironing time in half. Most of the buyers of this model also trust the Tefal brand, and it is of course a popular one in the UK. Overall buyers gave this one an excellent rating of 76%. This is about average ratings for this type of iron. Below we explain what the lower ratings are all about, so as you have a full understanding of this product. Ideally we like to see 80+ satisfaction ratings, so this one falls below that. This type of iron is all about speeding up the dreaded ironing process. You pick the ideal setting which can be delicate, normal or jeans. The high pressure steam (up to 6.5 bars) then penetrates fabric, saving you time, and making ironing easier. Buyers liked the fact that you could remove the tank, fill it at the tap and then bring it back to the iron. The tank was large enough to be able to all of your ironing with one filled tank. A good safety feature is that there is a smart locking function for safe and easy transport and storage. 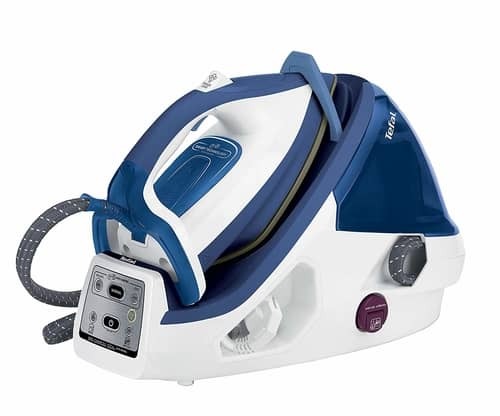 This model has a variable steam dial which allows you to regulate the amount of steam you use while ironing. It also has a soleplate temperature setting. That allows you full control over the heat settings for all your clothes. That is important as most fabrics have different ideal temperatures at which they should be ironed. Fabrics also come in different thicknesses so the steam settings ensure you find the ideal one. As an example cotton and silk are two common examples of different fabrics which need to be ironed at very different temperatures. A common problem with any iron is the soleplate. We are all aware of sticking soleplates, and also where water can leak out and cause rust spots which then mark the garments. This model has an autoclean soleplate. 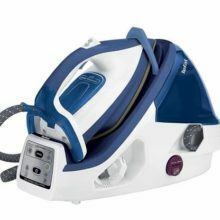 This Tefal GV8931 model has what is called a Durilium soleplate which has a very smooth surface which helps reduce resistance when ironing. The soleplate has a catalytic coating invented by Tefal to help you keep your soleplate without stains. No more risk of staining your garments. Hopefully we have provided you with enough information to decide if the Tefal GV8931 model is the right one for your needs. This is an expensive option when compared to all the other choices on the market. It does however have a high end specification, and overall gets good strong buyer reviews. We think the price will put many people off as it is a lot to pay for an iron. If you can afford it though, then it is a good buy, and from an excellent brand. Question - Does it have continuous steam? Answer - No, few of these steam generator models do, as the steam is already pressurised. If you are having problems with a stubborn wrinkle or crease, it is best to use the boost shot. Question - Is the limescale hard to clean? Answer - You remove the tray at the bottom of the iron, empty it and put it back in. It is recommended to do this on a regular basis. Question - How long to heat up?